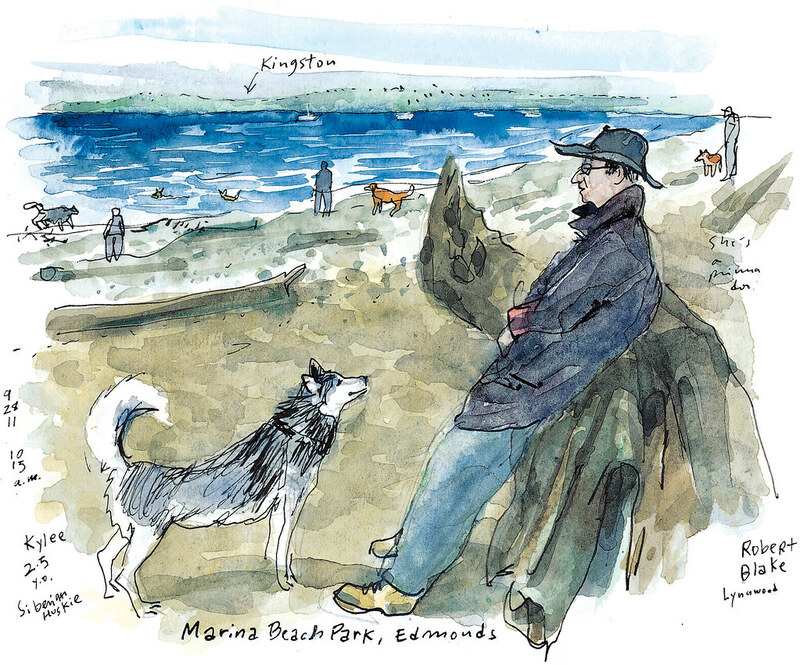 Sketched Sept. 28, 10:15 a.m.
Marina Beach Park in Edmonds is as scenic as any other park I’ve been to along Puget Sound. What makes it special is a fenced dog beach that dog owners there said is one of the best in the Greater Seattle area. My visit, suggested by a reader, helped me face my longtime fear of dogs and taught me that not every canine is the same. Some loved to dive in the water, others preferred jumping over driftwood, tasting seaweed or just strutting their stuff. With help from some visitors, I learned how to tell a Gordon setter apart from a springer spaniel and even encountered that iconic dog I’m accustomed to seeing on University of Washington merchandise. Robert Blake’s husky, Kylee, did me a favor by standing still long enough for me to draw her. “She’s a prima donna,” Blake said.